The Daily Cash Siphon is another program that promises to help anyone generate income with weird tricks that had legally siphons $395 a day for the owner. Their spokesperson, William Fairbrother claims that they have more than 9 years of experience in e-marketing industry and had made numerous income using strategy taught inside Daily Cash Siphon. And this is their most powerful cash generating system they've been using for years. However the promises of quick and easy money that are used in this program are also commonly used by black hat marketer. Their intention is just want to coax people into buying their product so they could make more money from you through expensive upsells. Normally this type of program will not last long and will disappear from the market after a short while. Some people even called black hat marketer a scammer because their product will not be able to help anyone make money. If you are not familiar with the term black hat marketing, here's what it means. How To Make Money With Daily Cash Siphon? Who's The Owner of Daily Cash Siphon? Is Daily Cash Siphon Black Hat or White Hat Marketing? Summary: Only basic blogging training is provided inside member dashboard. The sales video is intended to mislead you into buying the product with unrealistic income . 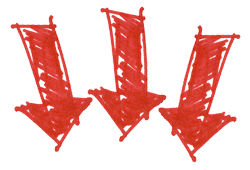 Unless you buy into the upsells that might increase your chances to make money, otherwise it is not possible to quickly make money with the basic training. 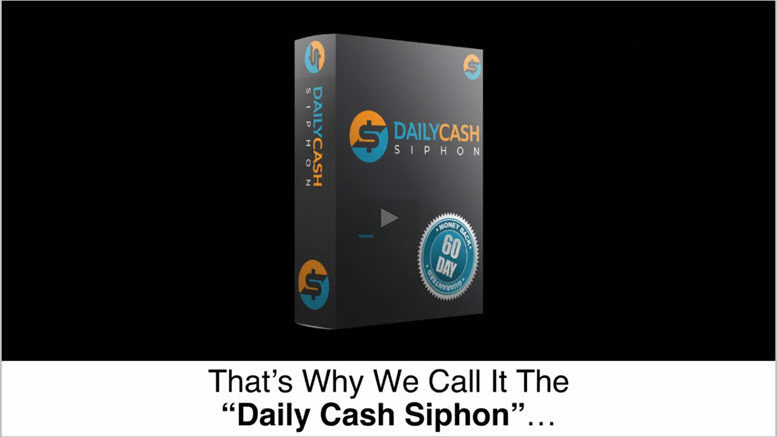 As the name indicates, Daily Cash Siphon uses a system to legally siphon money from multi-billon e-marketing industry to your ClickBank account every single day. But in fact it is only a training program on how to make money through affiliate marketing, focusing to teach you how to start a blog to make affiliate commission. If you are new to affiliate marketing, here's step-by-step guide to affiliate marketing. Unlike as claimed inside its sales video, there's no secret nor anything controversial about Daily Cash Siphon at all. The claim that not all people are suitable to make money using this system and people from some countries are not allowed to profit from this system are intentional. This claim is made because making money through blogging takes time and not everyone can have the patience for this. Furthermore, there are at least 40 countries not supported by ClickBank, so obviously not everyone can make money promoting ClickBank products. The claim that not all people can use Daily Cash Siphon system is just to let viewers feel “special” & “lucky” to discover this rare opportunity. But there's nothing rare about blogging. With such affordable price at only $37 (published) or $27 (discounted) one-time payment, many people will be more than willing to pay just to discover the so-called secret system. Most people won't even bother to ask for refund even if the product can't help them make money because it's just so cheap. 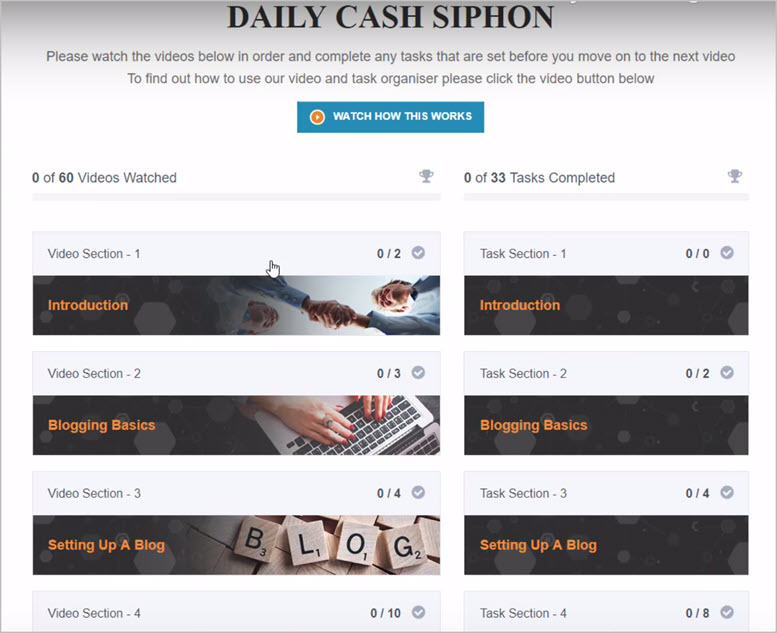 As I mentioned earlier, Daily Cash Siphon is all about teaching you how to make money through blogging. Below is a screenshot of the training area inside member dashboard. You can find 60 very basic training videos about blogging. Upon completing all training, you are not going to make hundreds or thousands in just a few days, not even weeks or months. The most is you'll just learn things on how to setup your WordPress blog, how to create post, do keyword research and other basic stuffs about blogging. For example, you will learn how to create a blog post using WordPress but you won't learn step-by-step on how to do research, structure your content and write a high quality article. You will also learn how to buy solo ads from Udimi but you won't learn how to identify genuine solo ads seller that can convert your clicks to sales. 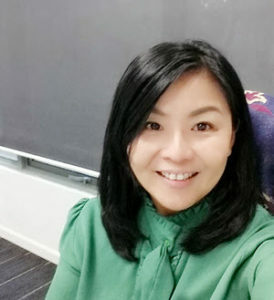 If you want high quality in-depth solo ads training, then I suggest you to get this free funnel system created by Patric Chan. High quality solo ads training is provided inside this free funnel for free. Another example is you are going to lose money sending solo ads to a landing page that's not collecting email list. That's what taught inside Daily Cash Siphon. All experienced marketers know that if anyone is paying for clicks, the bare minimum is you should optimize your investment by first getting your visitors to subscribe to your list before sending them to any affiliate page. I would say the training looks great on the titles, but if an experienced marketer looks at it, those are not real in-depth training that can help you make money. If you are looking for an in-depth training to start a blog, I suggest you to sign up for a free account here where you'll get 10 free training, 2 free websites and 7 days trial to learn from super affiliates. 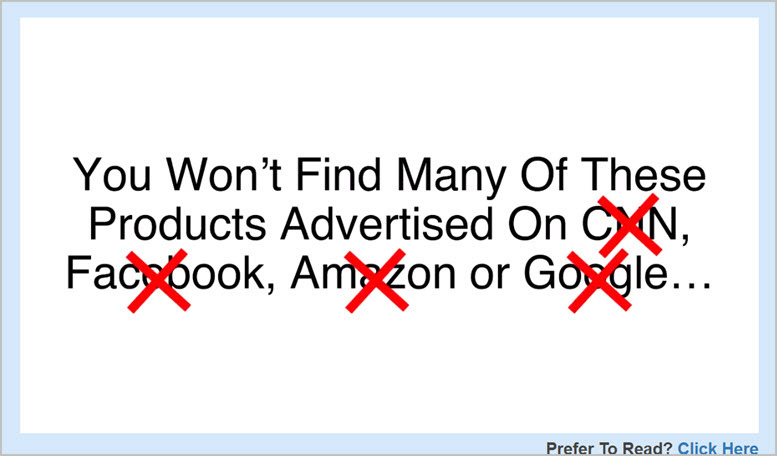 Remember inside the sales video, they say you won't see many of the recommended products advertised on big brands like CNN, Facebook, Amazon or Google? There's a reason behind this claim. The reason is the products recommended by Daily Cash Siphon are mostly make money business opportunity products sold in ClickBank. Facebook and Google dislike these products and therefore will not allow such advertisement on their platform as it goes against their advertising policy. Whereas Amazon is mainly selling physical products and therefore not suitable to promote there. CNN advertisement on the other hand is extremely expensive. No one is going to advertise on CNN just to sell a make money product that cost $37. One way to make money from this system is to become affiliate of Daily Cash Siphon and earn up to $358.12 per sale provided your customer buy the expensive upsells. Below is the commission rate of Daily Cash Siphon and its upsells. To become affiliate of Daily Cash Siphon, you will need to register by giving them your name, email and ClickBank id. But as you try to close the affiliate opt-in window without registering, there'll be a pop-up giving you full access to affiliate materials without the need to register. Daily Cash Siphon is dying to get more affiliates to promote their products! Throughout the sales video, only the spokesperson is doing the talking all the time. I bet you won't know whether this spokesperson name ever exists in real life. There's no mention of the real owner at all. However with more research I found that the owner is called Chris Parker, who is also the owner of 5 Minute Profit Sites and Profit With Alex. I can't verify information of the owner yet. 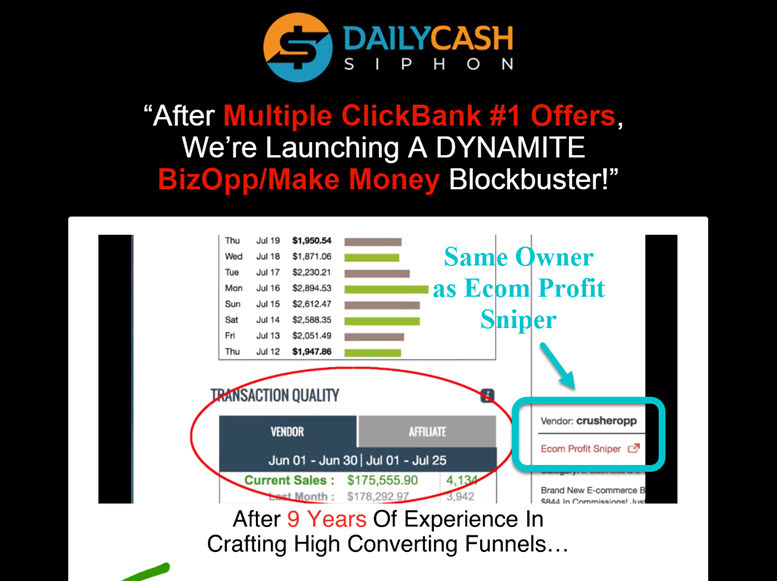 But one thing I found out through its affiliate recruitment video is that the Daily Cash Siphon and Ecom Profit Sniper might share the same owner with the ClickBank vendor id named CrusherOpp. 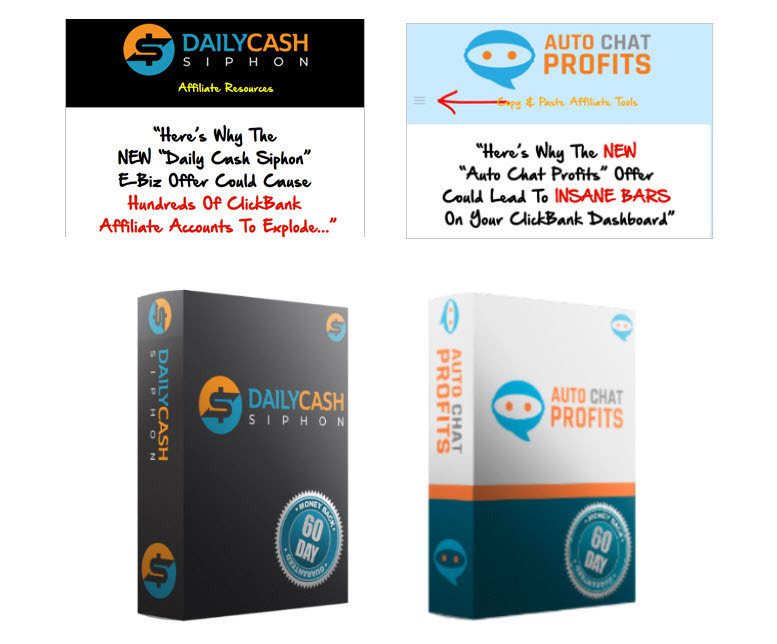 In fact, there are also similarities between Daily Cash Siphon and my recently reviewed product called Auto Chat Profits (discontinued after less than 30 days). Both their affiliate page and product are similar in design. All these are products come with some similarities that form part of black hat marketing strategy. Controversial of Daily Cash Siphon? Unknown Owner: Unlike 60 Minute Profit Plan, Home Income System and Second Income Center that fabricate fake testimonials using Fiverr actors, Daily Cash Siphon did not use any actors for testimonial at all. What they show you is income statement inside ClickBank. The owner chooses to remain hidden inside the sales video, despite there are unverified information about the owner. If Daily Cash System is really that good, I don't think any owner will not be proud to come forward and admit that this is his proud creation. Only the most profitable products will be recommended: Daily Cash Siphon system will automatically do research for you to select the most profitable and popular affiliate products to promote. However, there's no such feature inside member dashboard if you are just buying the basic product. I guess this is hidden inside one of the upgrades. If you are only buying the basic product, one of the training might teaches you how to manually identify ClickBank product that has high gravity, high popularity, low price and a sales video that keep people in suspense mode like Daily Cash Siphon. This means, you are likely to become part of a business selling low-quality products that can't help anyone make money unless they buy into those expensive upsells. Anyone wanting to promote Daily Cash Siphon had better to use a fake persona like how the owner remains anonymous. Because only via this method, you can make quick money and run away before this low quality system is exposed. Misleading sales video: Throughout the sales video, you are given the impression that it is easy and quick to make money using Daily Cash Siphon system. What you need to do is just to copy their simple moves…. Is blogging really that simple to make money? To make you feel special, the sales video is gaming your psychology by telling you that only people from selected countries are given access to this business opportunity. The truth is, some countries are restricted by ClickBank and not that you are special! Other than gaming your psychology, they fully understand that this system cannot help anyone to make real long-term income. Since, the real owner is never openly revealed, it's never a problem if any of such product fails to deliver as it can be discontinued easily. No one will be responsible. The thing that's really misleading is telling viewers that even lazy or people who have limited time can make money with blogging! Do you really believe this? Obviously, Daily Cash Siphon is all about black hat marketing. The over-promising and misleading sales video telling you that making money is quick and easy is not ethical. We all know to make real income from blogging takes time and it's not going to happen overnight. There's obvious manipulation of information to coax anyone into buying the system. Many people who bought Daily Cash Siphon are not aware of the expensive upsell they need to buy in order to make real income. They were kept in the dark from the very beginning. That is really unfair. No doubt, there are many people who don't mind to make money by applying black hat marketing that promises the sky, but definitely not for me. That's why I won't recommend anyone who want to build a long-term online business to start with Daily Cash Siphon because I know it's not going to happen. Like what was taught inside Daily Cash Siphon, I build my small business online through blogging too. But the difference is I won't choose any affiliate product just to make affiliate commission. The product that I will promote must be valuable and able to help my customers solve their problem. If you want to know the exact strategy I use to make money online, you can get my free guide here. I hope this Daily Cash Siphon Review has given you better insights about black hat and white hat marketing. If you find this post valuable, please share on your Facebook and Twitter. 16 Comments on "Daily Cash Siphon Review: Black Hat or White Hat Marketing?" Seems the Daily Cash Siphon does not sound like a bad program but why settle for less when you can have even better. I subscribed to your guide and got my free Starter account of Wealthy Affiliate. Seem like a great community of online marketers. I was greeted by members inside immediately after I setup my account. Can you share with me what’s good about this program? Yes, in fact the training inside Daily Cash Siphon is quite decent despite it’s not in-depth enough. But if anyone really want to build a long-term business, then Wealthy Affiliate is definitely better. At least there’s a community that’s going to give you support when needed. Great to know that you already join the free starter account. I suggest you start with Online Entrepreneur Certification training and read some blog of successful marketers when you are free. From there you should be able to get a better idea of how Wealthy Affiliate works. Do send me a private message if you have anything that need my help. Here’s the link to my Wealthy Affiliate profile. Well here we go with another review of an opportunity that is basically no good. I love seeing these reviews because it means we are helping educate those people who are about to buy these terrible products. For many of us that have been around for a while we can easily spot those programs but the problem is it is really hurting all the newbies that are coming into the industry. Thank you for taking the time to bring these fake opportunities to the fore front. It’s the only way we are going to make it stop. You are most welcome. There are just too many unrealistic claims of low quality products that can’t deliver decent results. I hope with more reviews made, all my readers are able to make sound decision on which program to choose. Sounds like the Daily Cash Siphon is one of those products that sounds like they’re offering a very secret technique only to be revealed that it’s already used everywhere else. Anyone can easily find basic training on how to set up with a WordPress blog on the internet. There are plenty of free training videos on YouTube to teach that. No need to pay at all. 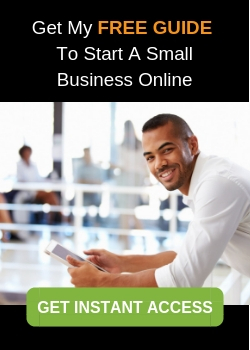 I just subscribed to your free guide on how to start an online business. It’s really informative. Reading about your strategy is already so valuable. Setting up a WordPress website is so easy and it’s free too. I share about the platform you can use to create a blog for yourself inside my free guide. Have you tried that? I started my website using this platform too. A must try for anyone who wanted to build a blog. It’s just so simple and absolutely free. Here’s the link in case you need it. Omg… this is so lame. Daily Cash Siphon is just trying to play with human psychology to lure people into buying this so-called “weird tricks” system which in fact is only a basic blogging training???? When I saw that the sales video uses a spokesperson, that’s already a red flag to me. My guess is this must be another low quality system that promises the sky but just can’t deliver results. Can’t they be more creative? They just repeat the same old tactics and trying to coax people into buying. Unfortunately, there are people who fell prey to this type of system with hyped-up sales video. I wish more people are able to find your site so they too can be spared from more of such scam. Will definitely share this on my social networks. I hope so too. If anyone interested to make money through blogging, I believe Wealthy Affiliate program is still the best. At least the strategy taught is proven with many success stories from complete newbies who are willing to put in hard work. Here’s my Wealthy Affiliate Review if you are keen to know more. Luckily I found your post while researching for Daily Cash Siphon review. I’ve been reading many reviews before yours but only few show inside view of this program. Yours is definitely the most comprehensive ones. I’ll definitely remember your six-point black hat strategy indicator so next time I’ll avoid program that indicates such signal. I am still trying to find one program so I can start a small business online. Need one that’s affordable yet teaches proven strategies. Do you have any program in mind? Maybe you can try Wealthy Affiliate if you do not mind to work hard for 6 months to 1 year in order to see results. This program focuses on free traffic strategies to create SEO-optimized content and promote affiliate products. I started my small online business with this program and so far the results is promising. There are many people who started as complete newbies managed to make decent income. You can check out my Wealthy Affiliate Review here to understand more. Alternatively, you might want to know How I Make Money With Wealthy Affiliate here. If you are interested to start now, here’s how you can register for a free trial account. I really liked your review about Daily Cash and I have to tell that you found another useless product. This kind of sites just about selling a dream, but don’t teach enough to reach it. I saw many sites like that. When you try to quit from the site and it stops you with a pop-up with a new offer or something catchy, RUN! These programs do not worth a $. Btw, do you have any good recommendation for a complete newbie to start affiliate marketing? I thought of giving this a try. I started my small business online with a program called Wealthy Affiliate. This program has helped many newbies make 5 to 6 figure income working from home. But the downside is you might need to work very hard initially and will only see results after 3 to 6 months. But in order for you to make decent income, it might takes you 1 to 2 years time. If you do not mind about this, then I suggest you try join as free starter member to give this program a try. As Free Starter Member, you are given 2 free websites, 10 free training lessons and 7 days access to super affiliates. I will get in touch with you when you are inside. See you soon. Daily Cash Siphon sounds like they promise the world but deliver very little. They would be better off promoting it as a beginners course for blogging basics. Sounds like they overpromise and underdeliver which is the opposite of how you want to run an online program like this. But I’m sure many people will fall for this fluff tactic. The shiny object syndrome once again. Thanks for the review. Now I won’t fall victim to this program. Yes, the main problem with this program is the over-promised made inside the sales video. Furthermore, it’s really misleading to indicate that anyone can easily and quickly make money just by getting into the basic training inside Daily Cash Siphon. If they didn’t make such a claim, maybe the training inside might be justifiable. Daily Cash Siphon sounds like just another “get rich quick” promise. Any time one of these guys pops up and promises quick money with little work, all my red flags go up! And thanks to your post, I didn’t have to waste the time setting up an account and learning (what I already knew) for myself. I still like to check these kind of “programs” out from time to time as they sometimes have valuable free content. But from the sound of things, the free content is pretty weak, and the immediately try to up sell you. Forget that!!! Is there any substitute for hard work when it comes to affiliate marketing? If there is, I haven’t found it! Anyway, thanks fo the review…this is definitely one I will be avoiding. Hi, great to know that you find my review valuable. In fact, I enjoy writing product reviews on biz opportunity programs. As I write, I learn more about how other marketers promote their products. For me, I choose to build my online business using white hat strategies. That’s also the reason why I started with creating valuable content on product reviews to get ranked on Google and get free traffics. But it’s not an easy journey. Building an online business focusing solely on free traffics takes time. If you are lucky, you can see results within 6 months. On average, a complete newbie can only start to earn decent income in 1 to 2 years time. Despite saying this, SEO Marketing is the most sustainable and long-term strategy proven to help anyone make strong passive income. If you do not mind this hard work, then I recommend you to start learning by getting MY FREE GUIDE to start a small business online. Do try by following my step-by-step method. I guarantee you’ll like it!